Last week I had a Walgreens giftcard burning a hole in my pocket, and I decided to pick up one of the new SinfulColors SinfulShine shades. I thought Picante was a perfect summer shade. Available exclusively at Walgreens for $2.99 for a limited time, the SinfulShine line with Gel Tech™ provides opulent rich color and superb shine. Picante was a dream to apply. Two coats gave perfect coverage, although Picante *is* a bit of a jelly and I did have a bit of visible nail line. This picture was taken on Sunday afternoon, after I painted my nails on Saturday night. I'm writing this post on Monday morning and my mani still looks perfect. I'm pretty impressed. 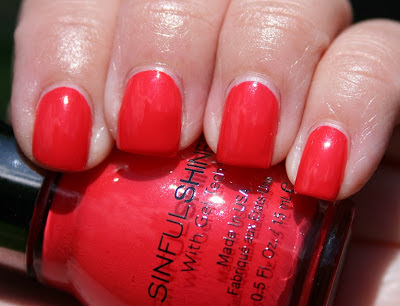 Have you tried any shades from the SinfulShine line?